M Humayun Kabir: A total of 37 students involved with the recent student protest and quota reform movement have been given bail amid widespread call for their unconditional release. Among them, 14 were among the 22 private university students arrested in the follow through of the recent student protest for safe roads in the first quarter of August, reports The Daily Star. Dhaka Chief Metropolitan Magistrate Saifuzzaman Hero granted bail to Iftekhar Hossain, arrested in a case filed with Badda Police Station. Metropolitan Magistrate AKM Mainuddin Siddiqui gave bail to 13 private university students. They are Shakhwat Hossain Nijhum, Shihab Shahriar, Azijul Karim Antor, Mehedi Hassan, Masad Mortuza Bin Ahad and Adnan Ahmed, shown arrested in a case filed with Vatara Police Station; and Nur Mohammad Zahedul Haque, Md Hasan, Redwan Ahmed Tarequl Islam, AHM Khalid Reza, Reza Rifad Ahmed, Mushfiqur Rahim and Rashidul Islam. All of them were shown arrested in a case filed with Badda Police Station. 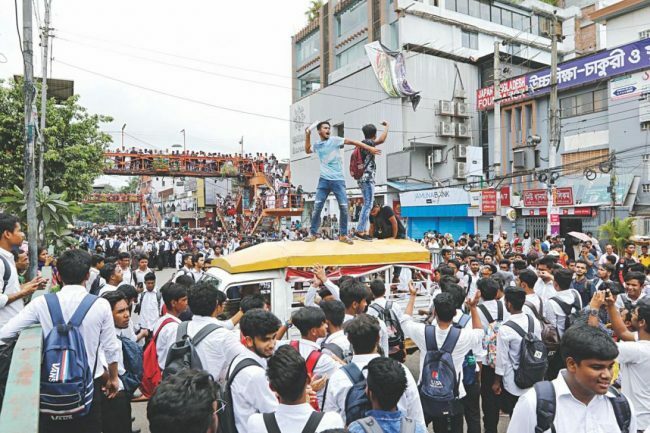 In total, the 37 students were arrested in different cases filed with Badda, Vatara, Uttara Paschim, Shahbag, Dhanmondi, Paltan and New Market Police Stations. Among them, 12 were implicated in cases filed with Badda police, six with Vatara police, three with Uttara west police, one with Shahbagh, Paltan, and Kotwali police, nine with Dhanmondi police, and three others with New Market police stations.